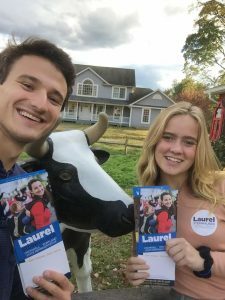 Over fall break, I canvassed for Laurel Steinhauser’s campaign through the office of the Cromwell Democratic Town Committee. From Saturday-Tuesday, we spent about six hours everyday walking around Cromwell, knocking on doors, and enjoying the lovely (but sometimes cold) fall weather. As I learned a couple of weeks ago, not many people are home or are willing to answer their doors or talk to a stranger about politics. Going into this experience, my main goal was to knock on as many doors as possible. Although I do not have a concrete number, I believe that everyone working on Laurel’s campaign over break collectively knocked on at least 150 doors a day. We traveled all over Cromwell, knocking on doors of Democrats, Republicans, Independents, and unaffiliated voters. One of the hardest things about canvassing is convincing someone of the other side of the aisle to at least hear you out. Many people at the door heard the word “Democrat” and wanted nothing to do with the conversation. But, when I was able to break things down a bit more, and ask people what issues they care about, I felt I was able to show them that Laurel might actually be the candidate they want to vote for. What made up for the sore feet, cold hands, and doors shut in my face were all the genuine connections and conversations I had. I will leave out her name, but I had a great discussion with a woman who did not like the direction the country was heading. She then proceeded to tell me that she had never actually voted before (she was in her mid 60’s), and I might have actually convinced her to register and vote in the midterm election and in 2020. Whether or not she ends up voting, it feels good to know that I at least got one more member of the public to think about voting and care more about the events going on around them.